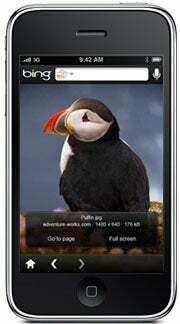 Bing on the iPhone: Has Apple's Holy War Shifted? Some of tech's biggest battle lines may soon be shifting. Apple is in talks to make Bing the iPhone's default search engine, according to a report published in BusinessWeek today. Microsoft's search would replace the iPhone's current default -- yep, you guessed it -- Google. The story, which cites the always-popular "people familiar with the matter" for its information, says talks between Microsoft and Apple have been underway for weeks. If true, it could mark a monumental shift in one of tech's most relentless wars. Let's start by setting the stage: Google and Apple, you see, used to be pals. They played nicely together, with Google holding valuable spots as the default search provider for both the iPhone and Apple's PC-based Safari browser. The real rivalry, of course, was always between Apple and Microsoft -- just look to the ads if you need any proof. It wasn't until Google began testing the waters of mobile development that the tides began to turn. With the open-source Android platform, the plethora of Google-supported anti-iPhones, and that one Google-sold super-duper-phone, the G-Force suddenly stopped looking so sympathetic to Apple's interests. Throw in the spats over mobile apps (e.g. Apple saying "We don't want Google Voice or Google Latitude for vague reasons that don't quite make sense") and the native maps function rumored to be coming to iPhone 4, and our former buddies really aren't seeming so chummy. The fanboy fights appear to reflect the changing trends. Sure, you still see the PC vs. Mac comment clashes; those aren't going away anytime soon. But as smartphone use continues to surge and we spend more and more time with our handheld devices, our tech identities are becoming increasingly dependent on our phone preferences. These days, it's as much a question of Android vs. iPhone as it is Mac vs. PC. Windows Mobile, incidentally, may be where this alleged Microsoft-Apple deal gets most interesting. Along with Microsoft's upcoming Windows Mobile 7 release, the Redmond rangers are now rumored to be preparing their very own custom-branded smartphone. The so-called "Zune Phone" would supposedly be made by a third-party manufacturer and branded by Microsoft. I hear the device might even offer live blue-screen-of-death wallpapers and a race-changing photo editor, though I'm not sure how reliable those last bits of info are. But I disgress: The point here is that with its own full-fledged phone, Microsoft would be positioning itself as a direct competitor to Apple's iPhone. So would that factor force Apple to reconsider any default-search decision? It's tough to know for sure -- we're speaking about layers of hypothetical situations, after all -- but one would think that even a "Zune Phone" would be less threatening to Apple than Google's growing gaggle of Android devices. All things considered, it seems safe to say the new battleground is firmly situated in the land separating Cupertino from Mountain View. JR Raphael is a PCWorld contributing editor and the co-founder of eSarcasm. He's on Facebook: facebook.com/The.JR.Raphael.